While training for my first Half Marathon, I grew bored with music. My mother suggested that I listen to Audio Books while running and I signed up for 30 days free trial from Audible. After my preview was over, I got an Audible Gold monthly plan and for $15 a month, I get one book credit a month (some of the audio books are in the $20 range). After downloading, I can send the books to my kindle and can switch back and forth between the devices. I just finished Alex Cross, Run by James Patterson. This was the first book I did not sync to my kindle or iPad. I found by doing this, I had more ambition to get out there and run and not cut my distance short. Towards the end of the book, I ran multiple days in a row since I needed to know what was happening next. Although I've had an Audible account since December, I have only downloaded 4 books. That meant I had 5 book credits in my Audible bank when I checked my account this week! 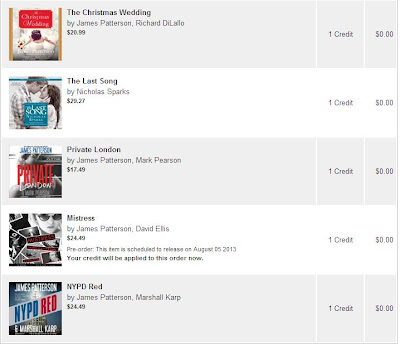 I went ahead and spent my credits, ordering 4 James Patterson novels (one pre-order) and 1 Nicholas Sparks novel. 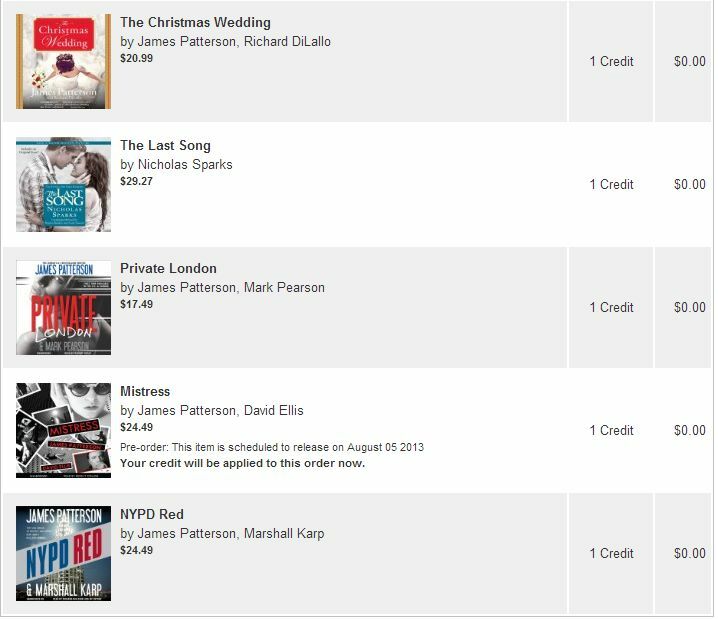 I accidentally ordered The Christmas Wedding by Patterson and luckily, Audible allowed me to exchange it for Second Honeymoon with no questions asked. If you are a running bookworm, give this a try. You will be very surprised to see how fast the miles go by. I've loved all three James Patterson books I have listened to so far. All three have had two different voices which breaks things up a bit. Some have been two males and others have been one male, one female.